Yes it’s pronounced JUM BUH laya. I get it. I’ve been saying one of my favorite dishes of all time completely wrong. But I don’t think it’s as bad as when I was in Australia and someone said “You want ‘Pilila’?” She meant Paella. But saying Jambalaya the right way is old news. Someone told me once that as you move towards New Orleans, you start to see less use of tomatoes. And vice versa. That’s such a cool regional distinction. Mainly because most of my Cajun experience has involved plenty of tomatoes, especially in Jambalaya. That’s the Creole way. This choice in tomatoes got me thinking about pasta. Everyone attributes pasta with tomatoes. If you don’t you didn’t have a childhood (Spaghetti and Meatballs!). So here I stood in my kitchen, thinking of what to make for dinner before I head out for a Saturday Night. I wanted something tasty and hearty (absorb some alcohol?) but quick to make. And creative me just said, make Jambalaya in a pasta. I’m a monster. This is recipe is pretty funny because it starts Cajun and ends Creole. You’ll see what I mean. Bring salted water to a boil. The pasta takes only about 7 minutes to cook. Have something to reserve about 2 cups of pasta water. Don’t place the pasta in just yet. In a pot on medium high, brown the Andouille Sausages in some olive oil. Once the sausage is browned, remove from the pot. Takes about 3-5 minutes. Now add the pasta to the water. Add move oil if the pot looks dry. Then add the chicken and saute for about 2 minutes, just browning the outside. Season with Salt and Pepper. Then add the trinity and some more salt to soften the veggies. The chicken should not be cooked through and should be soft still. Add the chicken stock, and about a cup of the pasta water. Thrown in the bay leaf, cover, and simmer on medium heat while the pasta finishes. Stir occasionally. It should thicken up nicely with that pasta water. Drain the pasta when it’s al dente. 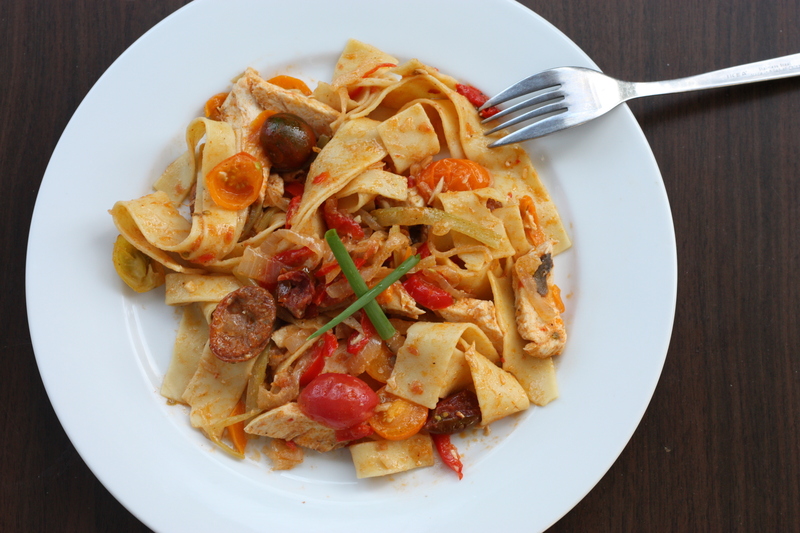 Return the pasta to the pot it boiled in, and then add the Jambalaya over the pasta. Toss well. Remove that bay leaf. I added a dash or two…or three of tobacco to spice it up. Along with a dash of Romano cheese. It’s pasta, gotta have cheese. No tomatoes ? I guess this is Cajun style. But it’s pasta. So I garnished with heirloom tomatoes at the end. Does this make it Creole now?! Maybe? Garnish with some of that chopped green onions. This was surprisingly light, but filling pasta. The great thing is julienned veggies are easy to pick up with the pasta. You’re welcomed. I’m probably going to get a lot of heat from the Cajun/Creole communities. But this was worth it. Enjoy! 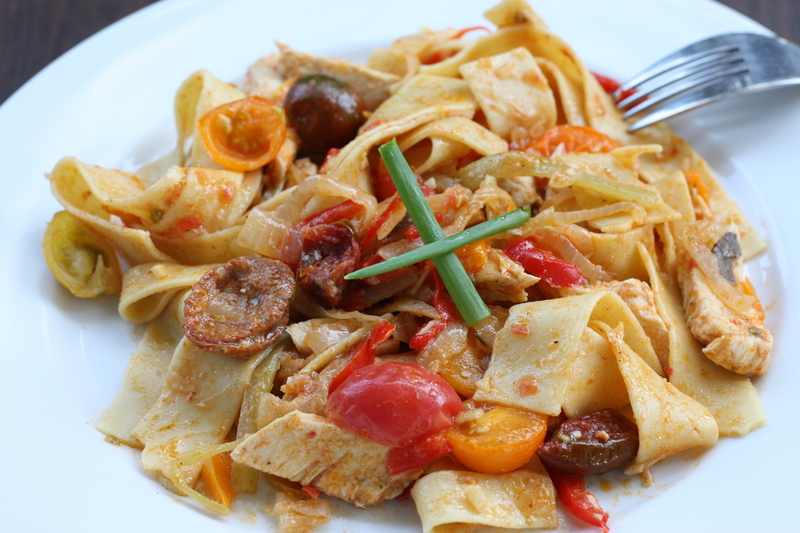 This entry was posted on June 3, 2012 by rrfoods in Chicken, Dinner, Lunch, Pasta, Pasta and tagged andouille, bell peppers, cajun, chicken stock, creole, Dinner, jambalaya, lunch, pappardelle, pasta, quick, sausage, trinity.